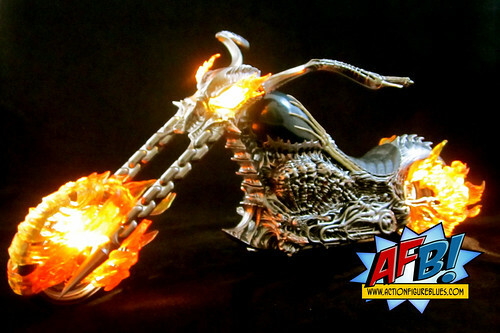 AFB speeds into the Hot Toys world on a Hellcycle - Ghost Rider style! If you’re a regular reader of Action Figure Blues, you’ll now that I am always ready to try a new line of toys, and often break my “rules” of things I don’t collect. I started off as an action figure only collector, then moved into statues - mini-busts first, thank you - before falling down the slippery Sideshow slopes of Premium Format Figures and Comiquettes - yes, that sobbing you hear is probably Andy’s wallet! One collecting “slippery slope” I stayed away from as long as possible was Hot Toys. Their 12” figures are incredibly impressive, but not cheap, and I kept myself from crossing that particular line for as long as I could. 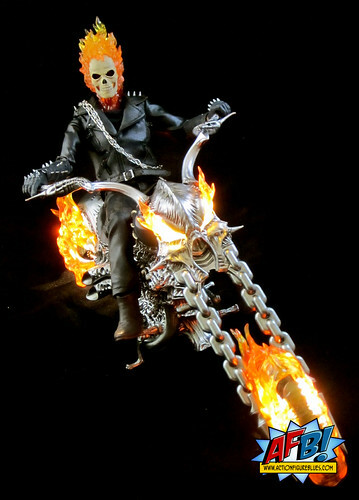 The moment I saw the Hot Toys Ghost Rider with Hellcycle, which premiered at 2010’s San Diego Comic Con, I knew I was doomed. My fate was sealed when I found this for a great price (including free shipping) at the website of AFB Sponsor Popcultcha! One that that has helped me stay away from Hot Toys for this long is that I’m not big on movie versions of characters, particularly at the Hot Toys price point, but if you set aside the Nicholas Cage head (which I’m ignoring in this review) this is a comic accurate figure. The addition of the amazing Hellcycle and light up features on both the figure and the giant accessory make this a real delight. This is the first Hot Toys figure I’ve seen in person, so while I have appreciated the detail via the interwebs, this was my first chance to appreciate the craftsmanship up close, and craftsmanship it is. The Ghost Rider headsculpt is a thing of beauty. It is a mix of materials, with the flames encircling his skull made of a translucent material. His skull features a hinged jaw, allowing him to be posed with a closed or open mouth. The translucent flames support the figure’s light up feature, allowing the “flames” to glow rather brightly when the feature is switched on. One thing that is a bit awkward about Ghost Rider’s light up feature is that you essentially have to remove the head to switch it on or off. This figure comes with a “flaming” neck wrap for Ghost Rider mode and the switch is underneath it. It makes it a tad too fiddly for my liking. I’ll persist, however, because the effect is very cool. I love the way the “flames” glow through his eyes as well as around his head. The detail on Ghost Rider’s leather outfit is simply stunning, from the stitching to the functioning belt to the real and working zips. There is an excellent integration of metal into these pieces, with a range of studs on the shoulders and forearms of Ghost Rider’s gloves. These are well attached and sturdy, so there are no concerns about them popping off through normal wear and posing. The figure itself has the fantastic articulation you would expect from a Hot Toys 1:6 Scale figure. 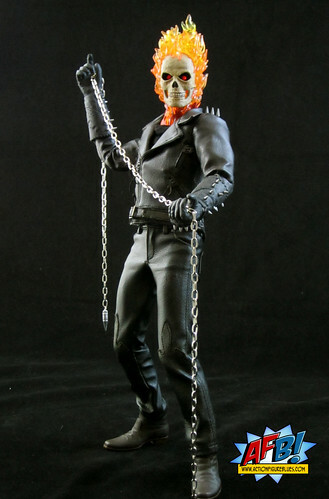 The leather outfit only slightly constrains Ghost Rider’s movement. He can easily be placed in a number of poses, including sitting easily on his Hellcycle. He comes with a second set of hands which means that he can either grasp his rifle or chain, or hold on to Hellcycle handlebars. Both the hands and head are easy to swap, not that I’ll be doing any head swapping! The Hellcycle is a truly impressive construction. The detail on this is just unbelievable. This isn’t just a 1:6 scale motorcycle - it has amazing chrome detail throughout, and is highly articulated in its own right. I am truly blown away by what Hot Toys has accomplished with this piece. The only small issue I’ve had with my Hellcycle is that on one side, the footrest and kickstand seem to have been inserted into reversed positions, making it a bit challenging to balance the Hellcycle. It’s not impossible by any means, and I may not even be correct about there being an error, but it seems a bit awkward. As I said, it doesn’t actually stop the cycle from standing or functioning in any way. The light-up features on the Hellcycle are very easy to activate via a switch on the cycle’s undercarriage, and that’s a very good thing, because they’re fantastic. Light-up stuff is often quite tame in person, but these lights are actually quite bright and make a real impact. There is a fiery glow in both wheels and the top of the steering column, which shines through translucent flames on the wheels and smaller flames on the steering column that create a look like fiery eyes at the front of the bike. Most light-up features don’t get much use past the unpacking stage in my collection, but the lights on the Hellcycle are ones I keep coming back to, and I expect I will for quite some time. So, thus ends the tale of how I ticked one more collection milestone off my list and started down the Hot Toys slippery slope. You can look out for reviews of a few subsequent purchases shortly, and I *may* have a few more on pre-order as well. I have to say that if I had to lose my Hot Toys cherry, this really was a very enjoyable piece to do it with! You can see more pics at Facebook, discuss this at the AFB Forum, and you can comment on this post to enter the September AFB Comment of the Month Contest! If you're in Australia, please do have a look at our sponsor Popcultcha for great deals (including free shipping on purchases over $99) on items from Hot Toys, Sideshow and more! This thing is seriously awesome looking and wish i could get one but its too pricey for me. Love it! Great stuff Andy! Man, I love this figure. I'm still holding out for a Hot Toys Hulk to pop my Hot Toys cherry though. DC Direct's Ame-Comi line continues to impress! NonCanonical Episode 75 is live! Club Infinite Earths Lives - and so does Metron! AFB Asks Matty for September 1 2011!